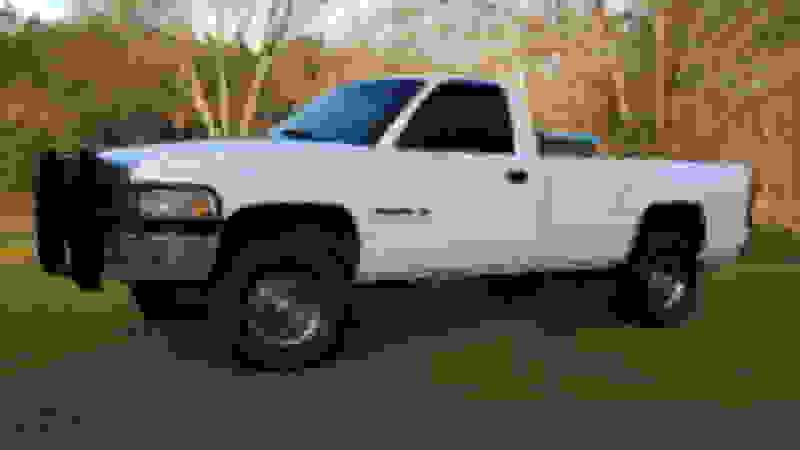 I have a 2001 Ram 1500 5.9 with the Off Road Package (factory lift). In 2014 I decided to put a 2.5 inch leveling kit on it, as well as 20x10 Rockstar wheels with a -24 mm offset. The tires I've used since then are Goodyear Wranglers that are 275/55R20. The were not the tires I wanted, because I wanted M/T's and these were barely A/T's, but they were all I could afford at the time. I've only put 5k or so road miles (don't drive on highway due to wobble at 55 mph) since 2014. I don't even think this size of tire was made for a wheel that was 10 wide, and part of me thinks that's why it wobbles. Me and my dad rebuilt the front end in 2017, but it still wobbles. The time has finally come to where I plan on buying new tires in the summer. I've been looking at Federal Couragia M/T's (cheap and like the treads/look) as well as Firestone Destination M/T's (would be $1000 installed at my local Firestone). I'm not sure of which tire size to purchase though. I'd love to have 35's, but don't know if the offset at -24 mm, as well as the Off-Road package lift plus leveling kit changes that a lot. I'd prefer to not have any rubbing, or do any trimming. Obviously if I can't run 35's then I'd get 33's. I just wanted some input on what I should get because it's definitely expensive and I'd rather not make a bad decision just guessing. Below I have listed some links to pictures. Thanks guys! I am thinkin 33's would fit pretty well. (though, they may still look small....) Clearance in the back just won't be an issue. You may be able to re-form the inner fender liners a bit. Use a heat gun to soften them up, and a block of wood to press them back to give more clearance. Don't know how much you can get that way.... Enough for 35's?? Maybe.... The 10 inch wide wheels aren't going to help you with that though. Maybe slightly longer control arms to push the axle forward a bit? Adjustable track bar to re-center it?? Do you have any pictures? I'd love to see! You could always sell your current wheels, and get something that will fit a bit better. Last edited by Grasscarlatemodel; 03-25-2019 at 10:52 AM. Have you done anything mechanical (gears) to the truck? He has the off-road edition truck, so, he already has 4.10:1 gears.